ShopJeepParts.com was started with one goal in mind: to best serve Jeep owners by keeping overhead low and then passing the savings on to customers. Our team not only has a strong background in web development and in successfully operating an online business; we are also passionate about the Jeep and the culture it has created. We realized that by applying our expertise to our passion, we could provide a great service to those who share our zeal for the Jeep experience. The end result is ShopJeepParts.com! Our team at ShopJeepParts.com is knowledgeable about all type of Jeep parts & accessories and enthusiastic about providing customers the quality products that they need. Over the years we have developed relationships with some of the most reputable manufacturers in the business, which enables us to carry an extensive collection of Jeep accessories and parts for customers to choose from. Service is priority one; we work hard to ensure that Jeep owners are able to fit their personal needs with the highest quality products at the best possible price. Our company may not be the greatest in size, but we strive to have the greatest work ethic and best customer service. Don't take our word for it - give ShopJeepParts.com a try! LOW PRICE GUARANTEE: Rest assured, you'll always get the best deal available. DETAILED PRODUCT LISTINGS: Our product listings include high resolution images, product installation guide, products videos & hundreds of customer reviews. We make it easy for you to find the perfect item for your Jeep. FREE SHIPPING: ShopJeepParts has Free Shipping everyday no matter how large the item is; we cover the shipping on all orders over $75 (lower 48 states only). TOP QUALITY NAME BRANDS: ShopJeepParts only carries products manufactured by industry leaders who have earned their reputation for excellence, often with more than 20 to 50 years experience. We sell products from up and coming and innovative manufacturers whose products we evaluate very carefully before offering them to our customers. HONESTY & INTEGRITY: You will never be surprised by hidden handling charges or shipping fees. All our prices are provided upfront. If you are unsure of anything, we are always available via email or phone to give you accurate information. Thank you for your business! 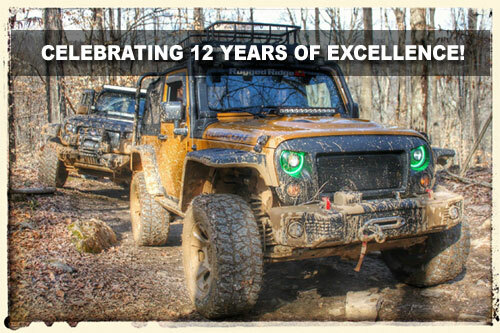 We look forward to servicing all of your Jeep needs both now and in the future, and hope that you will share your positive experience at ShopJeepParts.com with your fellow Jeep owners.